1. The sun is only for the elite in the novel. You can read this while you soak up the summer rays. 2. The two main characters, Arden and Dade, come from different social standings, so there is a strong chance there will be some Pride and Prejudice or Romeo & Juliet influences. In a stratified society where contact with the sun is a luxury reserved for the elite, those kept prisoner in the darkness will do anything to find the light. Arden—beautiful, street-smart, and cynical—is one of the citizens of the lowest level, known as Undercity, of an off-world colony. A blackout band traps Arden in her district, but as sister to the leader of the most powerful gang in Undercity, she has access to the Above. 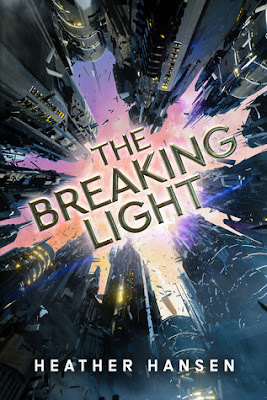 We have ONE copy of The Breaking Light up for grabs thanks to Skyscape. This giveaway is open to US residents. You must be 13+ years of age to win. If you are under 18, you must have parental permission to enter. Reading Lark is not responsible for lost or damaged prizes. The giveaway runs from May 15-22. Winner will be notified via email on May 23. I think the synopsis and setting sound really neat. Thanks for the chance! Like the story line. Looks like a good read. I love the idea of this book! I tried to add it to my wishlist but couldn't find it on paperbackswap.